The steps announced Monday all feed into Obama’s goal of cutting overall U.S. emissions by 26 percent to 28 percent over the next decade to combat climate change and encourage other countries to do likewise. 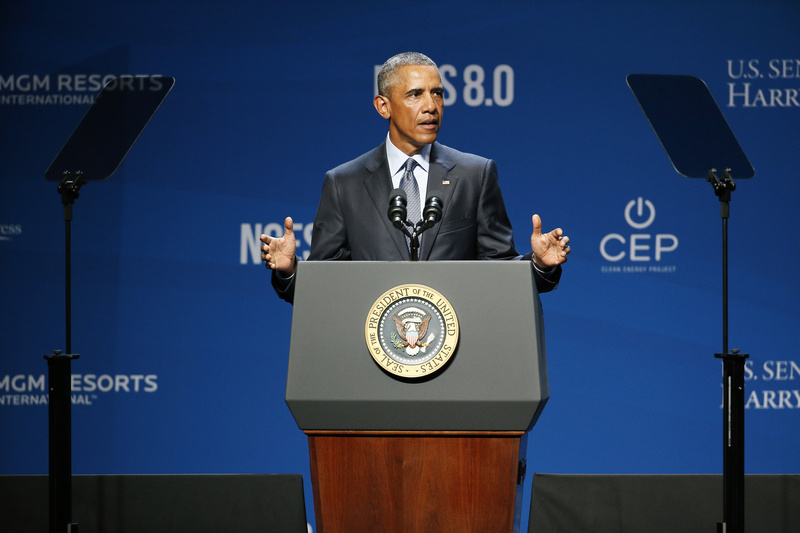 LAS VEGAS – President Barack Obama on Monday accused fossil fuel interests and other critics of his energy policies of trying to restrict consumers from accessing solar, wind and other renewable sources in order to protect the status quo. The president also questioned the ideological consistency of those who champion free-market solutions, except when the free market is pointing to the wisdom of renewable energy. He singled out billionaire brothers Charles and David Koch, who are major donors to Republican political candidates. The annual energy conference was hosted by Senate Democratic leader Harry Reid. The Nevada senator frequently targets the Koch brothers, depicting them as self-serving oil barons who pay huge sums to try to buy elections and advance their agenda of low taxes and less regulation at the expense of average Americans. Obama used his appearance to announce new executive actions and other efforts aimed at making it easier for homeowners and businesses to invest in green energy improvements that in the past may have been impractical or unaffordable. “We’re taking steps to allow more Americans to join this revolution with no money down,” Obama said. The moves, which include expanding the use of energy improvement loans, are designed to build on the clean power plant rules that the president announced earlier in the month to cut carbon dioxide emissions from coal-fired power plants by a third. The actions Obama announced Monday focused on giving families and businesses more say in what types and how much power they rely on. That could mean rooftop solar panels, once largely the province of committed environmentalists, or other renewable energy innovations.